Since 1963 the University of York has powered its way to a consistently high rank in the UK and after over 50 years of outstanding academic achievement, they are firmly established as one of the success stories in UK higher education. Their first half century of success is built on an ethos of equal opportunity and advancement for all, anchored by the highest standards of academic excellence. As a member of the prestigious Russell Group, which represents 24 leading research-led UK universities, they are committed to maintaining the very best research, providing an outstanding teaching and learning experience for their students from all backgrounds, and making unrivalled links with business and the public sector. The university offers a full range of academic subjects at both undergraduate and graduate level. During your studies you’ll be taught by leading academics whose research has global impact and directly influences the curriculum and course content. Your learning is supported by excellent academic facilities and study areas, including a large library which holds copies of essential texts and is open 24 hours a day, 362 days a year. You are further supported by your personal supervisor and a range of workshops. As one of the UK’s favorite cities, York is popular amongst students, residents and visitors. Life in York is varied, colorful and cultured. The historic city offers a diverse program of events including exhibitions, performances and festivals throughout the year. With its impressive historical buildings, winding medieval streets, specialist stores and boutiques, restaurants and thriving café culture, museums, galleries, theaters, live music venues and sports clubs, York has something to offer for everyone. The compact city center feels friendly and the city’s population of 200,000 gives it a cosmopolitan flavor. The university is located on a scenic parkland campus featuring two lakes, natural landscaping and a diverse range of flora and fauna. Different parts of campus are connected by footbridges, footpaths and cycle paths and a free bus runs between the two ends of the campus. On campus there are numerous amenities including shops, bars, cafés, cash machines and a doctor’s surgery. They have 15,000 students studying with them, and 23% of those are from outside of the UK, giving their campus a truly international atmosphere. As an international student you’ll be guaranteed university accommodation for the duration of your course, providing you apply by the relevant deadlines. They offer a range of on-campus accommodation to suit different tastes and budgets. Their accommodation forms part of their nine colleges – each college has its own values, atmosphere and support networks so you can be part of a smaller community within the university. A range of social events are offered through the colleges, and a healthy inter-college rivalry means you can represent your college in a number of student-led activities. You automatically become a member of the college you live in, and if you live off campus you can choose which college you’d like to belong to and you’ll benefit from all the same college-based support and activities. Many students live on campus, especially in their first year of studies. Your life at York is about much more than just your academic studies. Make friends, develop skills and gain experiences by taking part in the many opportunities available. York University Students’ Union (YUSU) supports a range of student-led activities, including student media opportunities, volunteering programs and over 180 clubs and societies. These cover a whole host of interests including football (soccer! ), american football, ultimate frisbee, dance, concert orchestra, knitting, photography, anime and manga… the list goes on, and if it doesn't exist, you can create it! Their active International Students’ Association (ISA) and Graduate Students’ Association (GSA) organize cultural and social activities while supporting the diverse range of students on campus. They also have two on-campus sport centers with a range of facilities including fitness suites, sports halls, studios, a swimming pool, floodlit courts and pitches, a velodrome and 49 acres of grass playing fields. The University of York takes your future career seriously. They have a dedicated Careers Service and encourage students to think about their future from the beginning of their time at York. Throughout the year a range of employers visit the campus and there are regular workshops to improve your skills. Careers’ also advertize a range of internship and work experience opportunities located both locally and nationally. Staff are happy to advise students who are looking to return home after their studies to work. If you are interested in studying at York University, please contact one of our Across the Pond Advisors. Professor Ian Graham, Head of the Biology department at the University of York, is one of three finalists in the 'International Impact' category of the BBSCR (Biotechnology and Biological Sciences Research Council)'s 'Innovator of the Year' competition, which recognizes the important impact bioscience research and innovation has on lives, society and the economy. In the Department of Politics at the University of York, students will enjoy an academic expertise second to none. Academics of this department boast expertise that spans the discipline – from early modern political thought to contemporary international security and from post-conflict development to global financial governance. York continues to be a strong contender in the rankings, and it recently has come out as a winner in the National Student Survey. The NSS is an annual undergraduate survey completed by students, and this year the students have spoken and declared York as a great place to study. The University of York will be holding subject-specific webinars from May to July to provide opportunities for offer holders, applicants, and prospective students to ask questions about their courses, the University, or life in York. The Management School at the University of York has now opened its graduate awards for the 2016-2017 academic year. Departmental scholarships of £5,000 (in the form of a tuition discount) are available to overseas applicants, as are travel bursaries of £1,500 each. Individuals with an offer for one of the School's graduate courses are welcome to apply. The deadline for scholarship applications is July 1st 2016. The Department of Music at the University of York still has a number of scholarships and awards, as well as work opportunities, available for graduate students for the 2016-2017 academic year. Candidates must have an offer (conditional or unconditional) in order to be eligible to apply for these opportunities. The deadline for most awards is June 1,2016. The University of York has five subjects ranked in the top 50 in the world, according to the latest QS World University Rankings, which rate universities according to their academic reputation, employer reputation and research impact. Want to work while studying at York? York University is looking for College Tutors for the next academic year. Candidates must be graduate students, and their role involves living in university house and providing a friendly face as first point of contact for other students (similar to the RA role in the US). University of York announces a funding opportunity for students that have already applied to undertake a PhD in Economics. These studentships are available to students in the US and have a value of £16,500 per year for a duration of three years. Candidates should have a good Masters level qualification in Economics, or a Masters with a high Economics or Statistics content. Are you a graduate student looking to study Biology? Consider the University of York in England. They currently rank 1st in the UK for Research Impact and are consistently ranked among the top 5 places to study Biology in the UK. You can learn more on Thursday, March 17th from 11:00 a.m. to 12:00 p.m. EST when academics from York’s Biology Department will be conducting an online chat session, just for you! Come with questions and leave with answers. For any Arts & Humanities, Social Science or Science students interested in the University of York, please take advantage of their Virtual Open Days on February 2-4, 2016 from 10:00 a.m. to 12:00 p.m. Eastern Standard Time. All students are welcome to drop by to chat with York’s academic and admission staff and current students about York’s degree programs, admissions process, accommodation and student support. This opportunity is not to be missed! 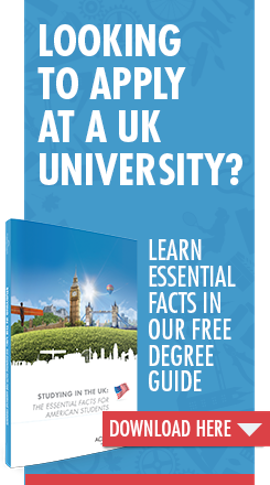 Want to study your Postgraduate degree in the UK but battling to get your academic references? We have good news! Some of the country’s leading institutions require only one academic reference, including the University of York. With our free and expert help there’s no reason not to apply! The University of York is an amazing university! It is a beautiful campus, has great teaching facilities and friendly and supportive faculty and staff. Had it not been for Across the Pond and my incredible advisor, I don't know if I would have ended up studying here, in the UK, as I have always wanted to do. My Across The Pond advisor took me step-by-step through the process of not only applying to university, but considering and accepting the offers I was made, getting the financial aid ball rolling, getting my visa, and even prepping me for my journey overseas. I knew I wanted to go to the UK due to the high standards for education, the language, and since the postgraduate degrees take around half the time than in the US.